Club Penguin Cheats by Mimo777 Club Penguin Cheats by Mimo777: Gary Has Sent Us A New Club Penguin Message! 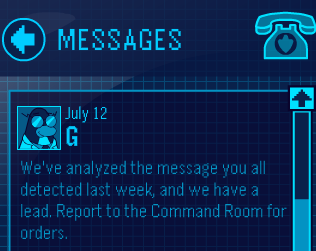 Club Penguin has sent us a new message from G! Hey Mimo!If we go near the paint buckets that is in the forest(near the planks of wood and the wooden box)our spy phone glows in a green color!I then clicked my Spy Phone, but nothing happened!Please find out the mystery behind this.Also take note of this:After I finished the field-ops,I went there again to see if my phone would glow,but it did not glow!!! Hey Mimo!I found out a secret! When I went near the paint Buckets in the forest,my spy phone glowed!When I clicked it,nothing happened! After I completed my field-ops,I went to the spot again but nothing happened! Not cool! Not cool! Not cool!